…but the illegal Compo Beach table-reservers are already out in force. Sure, the sign is there. 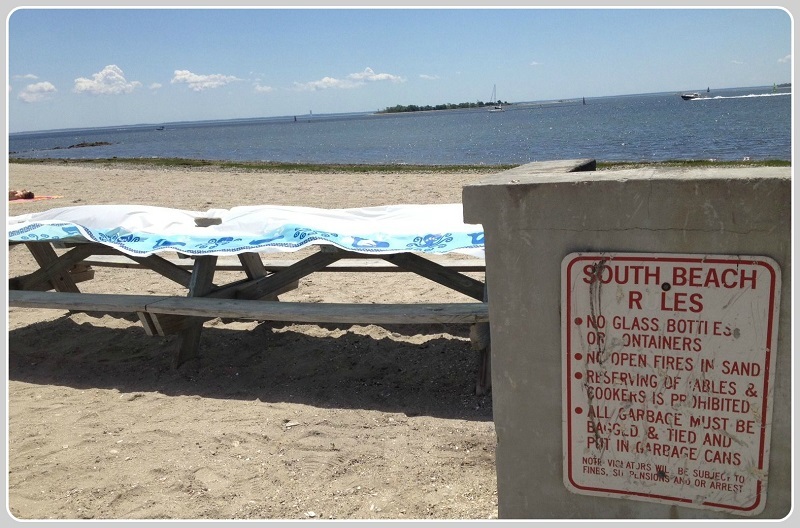 This entry was posted in Beach and tagged Compo Beach, Westport Parks and Rec. Bookmark the permalink. There’s “pot in garbage cans”? If there was a shortage of tables, and someone wanted one, they should just take off the table cloth, fold it nicely and put at the end of a seat; or I suppose, you could fold it nicely and then burn it in the BBQ. The beach patrol should go by regularly, like every half hour, and remove what is left there if no one is around. It would be nice if someone in violation could have their beach privileges suspended for a week or so, or after three violations, just not allow them or any of their cars at the beach. Revenge is certainly a common theme on “06880”, even on Memorial Day. Sandy for Chief of CBP !